Your gearbox (transmission) does plenty of work, changing up and down many, many times every time you drive anywhere. it needs lubricating just like the engine, just less often. The recommended time is every 30,000 miles. That's a lot of miles, but considering how old your Beetle is, there's a good chance it needs doing and the previous owner never did it. The toughest part of this job is getting your bug in the air and making sure you're safe when you're undoing the bolts on the gearbox, so it's worth doing if you have no idea when it was last done. You will also need to do this if you've had the rear brakes completely apart. The gearbox oil also lubricates the rear axle, so when you have the brakes completely apart, e.g. when replacing a rear backplate, the oil will leak out and need replacing. The gearbox is just in front of the engine. To get at it you need to crawl around under the car and to undo the bolt to get the oil out you need plenty of leverage, so you have to get the car up in the air a bit so you can get right underneath it. So, jack up the back of the car and put it on axle stands, or drive it up on to a set of ramps. The ramps my Dad has are slightly too steep for the Beetle to go up without scraping the back of the rear wings, so I had to jack mine. Once the car is safe on two axle stands, lie down underneath it. Never, ever get under a car which is only held up by a jack, no matter how good that jack might be. Plenty of mechanics have been crushed under cars just because a jack has collapsed, or let itself down gradually, trapping someone underneath. Take the left hand side rear wheel off (that's the left hand side as you're sitting in the drivers seat, looking out the windscreen.) You'll need access to a bolt on the side of the gearbox, and it's a lot easier with the wheel off. On the side of the gearbox is the filling hole, and it is quite awkward to get at. 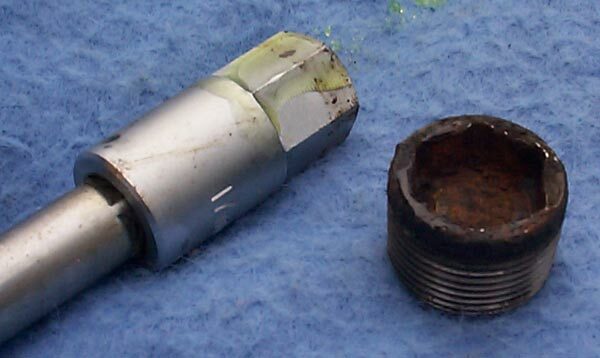 You need a 17mm Allen head socket or spanner (wrench) to undo the bolt. I have a socket and had to use an extension bar so it would stretch through to the bolt head. 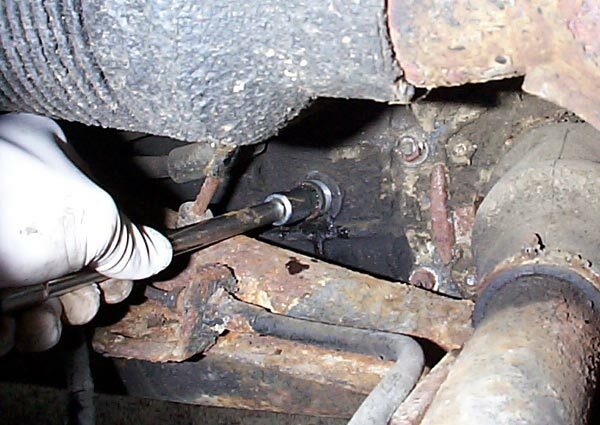 if you only have a spanner, this might be easier to do from underneath the car, but that is very awkward (did that on a Karmann Ghia once, hurt lots of muscles trying to get the bolt loose in such a confined space.) 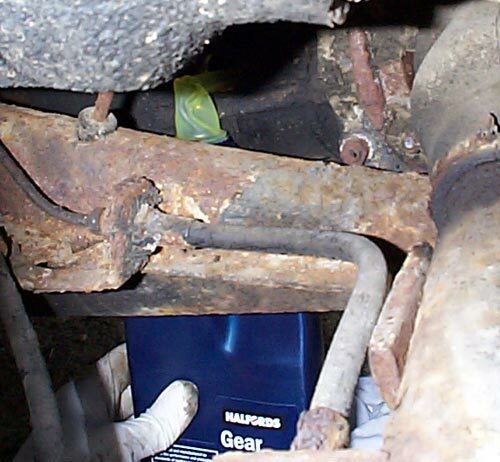 Take out the filler bolt, which means you know you'll be able to get new oil in to the gearbox once it's drained. Next, put your blanket under the car and crawl on to it, take the torch. You're looking for a hole for the 17mm Allen spanner to fit in to. 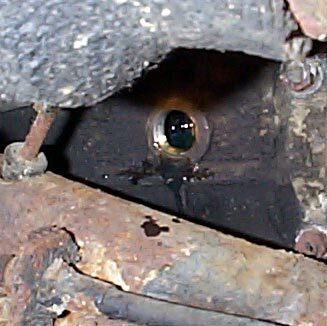 In front of the engine is a bulbous block, that's the gearbox, on the bottom will be the hole, you might need to poke about a bit if it's dirty and clean up the hole so the Allen spanner will fit in. The bolt fits right in to the gearbox, so it will be flush or almost flush to the bottom. When you take out the bolt, the oil is going to start pouring out, so you don't want to be underneath it. However, the bolt might not have moved for a few years, so you'll need to get it loose before getting out of the way. Put the Allen headed spanner or socket in the hole and get it a half or full turn loose, this might take a little while as it's tight under the car. Once the bolt is loose, get the bucket or whatever's going to catch the oil and put it underneath the bolt. You'll now need to stretch out to undo the bolt the rest of the way. Try to catch it before it drops in the bucket, but if you don't it doesn't matter as you can clean it off later. Now you have to wait for the oil to drain out of the gearbox. Time for a nice cup of tea. When the oil has stopped dripping out of the gearbox, you can replace the draining bolt and do it back up. Some oil is going to spill on the floor when the gearbox gets re-filled, so put something down that you don't mind getting ruined. The new oil I use is EP 80W-90 Hypoid Light Gear Oil, the label on the back says it's suitable for manual gearboxes. The new gearbox oil now needs to go in to the filling awkward hole. Fortunately, the bottles the oil comes in have a pull-out spout. The idea is you pull the spout out until it stretches a couple of inches (or however long it'll go) and stick the end in the hole. Unless the bottle is on it's side (I couldn't get mine in that way) squeeze the bottle to pump oil in to the gearbox. Keep doing this until the gearbox is full up to the hole. Once it is that full the oil will start leaking back out of the hole. Let it leak out, when the oil is level with the bottom of the hole it has the right amount in and you can screw the bolt back in. Don't put the plugging bolt back in before the oil has levelled out or you can cause too much pressure in the gearbox and damage it. Wipe away any oil that dripped out, put the wheel back on and get the car back on it's feet. Job's done for another 30,000 miles. Thanks to Elizabeth Nelson for pointing out you should take out the filler bolt first, because it helps air get in to the gearbox to let the oil drain, and in case you end up with an empty gearbox and no way to fill it. This article has now been re-written to move the steps around to match her advice.